ABOUT NEW PACT FOR EUROPE - Efforts to overcome the current EU crisis are being hampered by profound disagreements over the future course of reforms. The period leading up to the European elections and the change in EU leadership in 2014 provides an opportune occasion to reflect on these challenges and the reform priorities for the next five years. 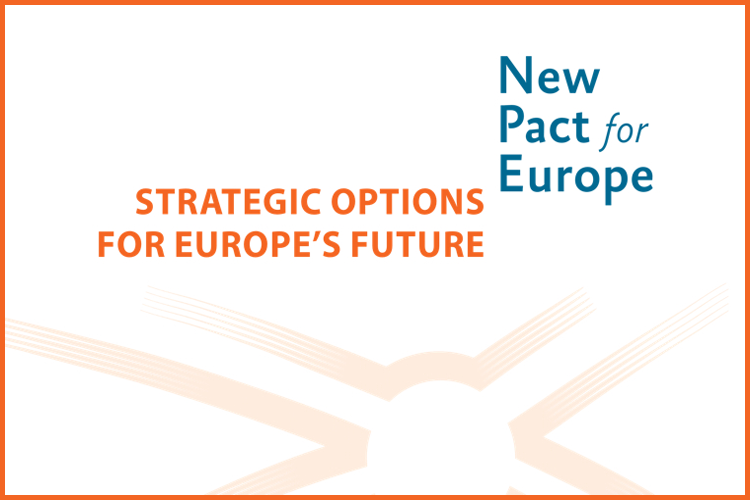 The goal of the New Pact for Europe project is to develop these reform proposals and generate new thinking and ideas about how to address the many challenges that Europe is facing, and help to close the widening gap between and within EU member states over Europe’s future. REPORT - The debate will be fuelled by this report, which analyses the 'state of the Union' and describes the key challenges Europe faces and presents five potential strategic options for the future of European integration. The report has been drawn up by a ‘Reflection Group’ of eminent EU experts from different member states. On Monday 3 February 2014, we have organised a ‘closed door policy makers debate’ in The Hague and a public stakeholders meeting on Thursday 10 April at de Balie in Amsterdam entitled In EU We (Mis)Trust (Info & Tickets).